The following is part one in a three-part blog series on sustainability by Falcon Boxpert and architectural interior designer Sarah Ellis. With concerns about enviornmental issues like global warming and trash buildup increasing every day, the topic of sustainability has received unprecedented public attention. Businesses (at least, those that are shrewd and responsible) have picked up on this phenomenon, and have begun vigorously marketing their more sustainable qualities and attempting to offer products and services that aid the modern consumer in leading the "green" lifestyle. Falcon is no exception to this, with the container construction we engage in consistenly being heralded as a creative, sustainable alternative to typical building techniques. But, what exactly does it mean when something is "sustainable," and how do our shipping containers abide by that definition? Simply put, sustainability is the capacity to continue. Within the context of construction, one would consider such issues as whether a building practice could be employed perpetually without depleting finite resources, filling up limited landfill space, or requiring vast amounts of energy to be built and maintained, to name just a few qualities. Shipping container buildings fit this description in a large variety of ways, and in this blog series I've narrowed down the top six reasons that they are a smart choice in the march toward a sustainably designed future; below are the first two. 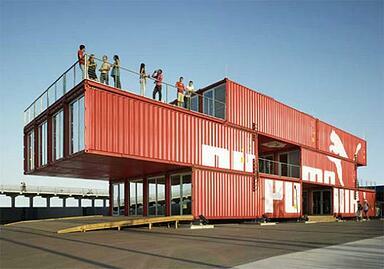 Shipping Containers are Not Recycled, but Upcycled. Traditional recycling of plastic, metals, glass and even some building materials often requires a significant amount of energy, and harmful chemicals and byproducts aren't uncommon in the process. This is because recycling involves changing something's physical state in order to recreate it as a raw material for re-use. Upcycling, on the other hand, simply consists of utilizing an object for a new purpose after its original purpose has been exhausted. Shipping container buildings are an excellent example of this concept, with little more than patching and paint needed between shipyard and construction site. Additionally, these containers are doomed to sit idly in a port and deteriorate if they are not re-purposed, and considering the fact that many of them make only one trip overseas before being retired, that adds up to an enormous amount of waste! Shipping containers are designed to conserve as much space as possible on overseas trips in order to cut down on lead time and transportation costs (which in turn reduces the carbon footprint associated with gas and energy consumed during their transit). The resulting standardized dimensions allow for excellent stackability and mobility, simplifying the design process and allowing for accessibility by people of all geographical locations. Furthermore, these straightforward, utilitarian modules are flexible enough in their design to be adapted into an enormous range of building types, from sleek commercial spaces to raw storage facilities. Next week: two more reasons shipping container buildings are outstanding options in the shift toward sustainable design.